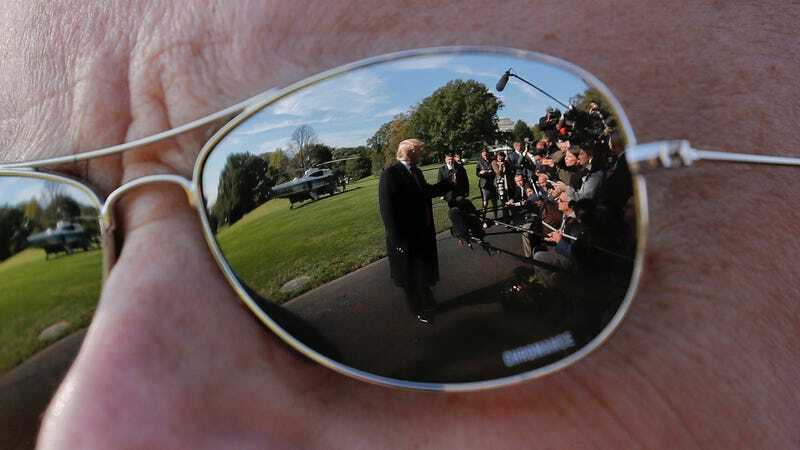 President Donald Trump on the South Lawn of the White House in October 2018, as seen reflected in the sunglasses of a Secret Service agent. The Secret Service is testing a facial recognition system in public areas of the White House and surrounding grounds with the stated goal of “identifying known subjects of interest prior to initial contact with law enforcement at the White House Complex,” according to Department of Homeland Security documents dug up by the American Civil Liberties Union. One of the areas selected for the FRP is in an open setting, where individuals are free to approach from any angle, and where environmental factors will vary (e.g., lighting, distance, shadows, physical obstructions). The second area of the White House Complex provides a controlled flow of individuals, which will be in a lighted area and free from other obstructions. For both locations, the technology used in the FRP will have the ability to capture facial images out to approximately 20 yards. This risk is not mitigated. The White House Complex is a highly monitored area with existing CCTV capabilities. Individuals passing the cameras involved in the pilot will not be able to opt out of having their faces run against the facial recognition algorithm. However, individuals who do not wish to be captured by White House Complex CCTV and cameras involved in this pilot may choose to avoid the area. Additionally, the documents stated that the entire facial recognition database will be stored in facilities at the White House that cannot be accessed remotely, while only authorized Secret Service personnel will be cleared to view it. The civil-liberties group also noted that the Secret Service does not disclose exactly how it defines a “subject of interest,” just what factors it may take into account while doing so. For example, the label could include protesters near the White House complex. It also warned that without congressional oversight to limit the practice, the Secret Service could use the technology in the future to monitor people far away from the immediate area of the building—such as the entirety of downtown DC, or potentially anywhere individuals who receive Secret Service protection travel. The use of facial recognition technology by law enforcement agencies across the country is growing, despite technical issues like false positives and the possibility it could be used to entrench racial bias. A 2017 Georgetown Law report on the Department of Homeland Security’s $1 billion “Biometric Exit Program,” which requires some international travelers to submit to face scans in the hopes of fighting identity fraud, concluded the program was rife with technical flaws and may not be legal. Tech giant Amazon has attracted congressional attention for Rekognition, a facial recognition tool that has already been in use by police and which the company pitched to Immigration and Customs Enforcement officials. Customs and Border Protection announced a pilot program at the U.S.-Mexico border earlier this year. After a gunman rampaged through the offices of Maryland newspaper company Capital Gazette in June 2018, killing five people and injuring two, authorities identified the shooter using the controversial Maryland Image Repository System (MIRS) after other methods failed.